Source: The Bee. (Earlington, Ky.), May 16, 1901, page 1. Source: The Bee. (Earlington, Ky.), May 23, 1901, page 1. Source: The Bee. (Earlington, Ky.), May 30, 1901, page 7. Source: The Bee. 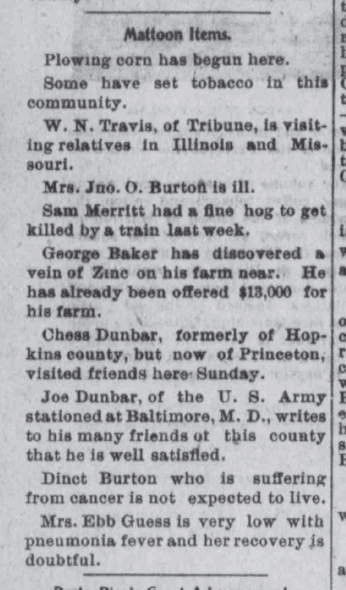 (Earlington, Ky.), June 6, 1901, page 5. Source: The Bee. (Earlington, Ky.), June 13, 1901, page 4. Source: The Bee. (Earlington, Ky.), June 27, 1901, page 5. Source: The Bee. 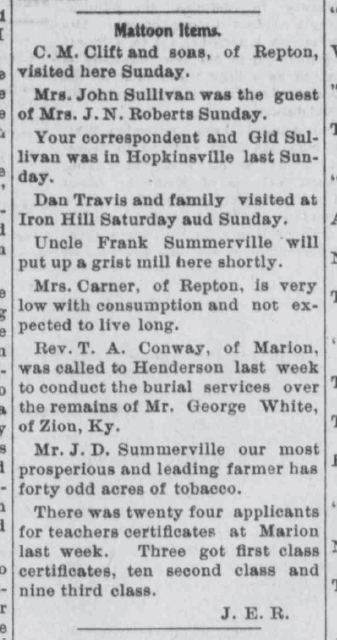 (Earlington, Ky.), July 4, 1901, page 7. Source: The Bee. (Earlington, Ky.), July 11, 1901, page 5. Source: The Bee. (Earlington, Ky.), July 18, 1901, page 7. Source: The Bee. (Earlington, Ky.), July 25, 1901, page 5. Source: The Bee. (Earlington, Ky.), August 8, 1901, page 5. Source: The Bee. (Earlington, Ky.), August 22, 1901, page 5. Source: The Bee. (Earlington, Ky.), September 5, 1901, page 2. Source: The Bee. (Earlington, Ky.), September 19, 1901, page 1. Source: The Bee. (Earlington, Ky.), October 3, 1901, page 4. Source: The Bee. (Earlington, Ky.), October 10, 1901, page 1. Source: The Bee. (Earlington, Ky.), November 7, 1901, page 6. Source: The Bee. (Earlington, Ky.), November 28, 1901, page 5. Source: The Bee. (Earlington, Ky.), December 12, 1901, page 4. Source: The Bee. 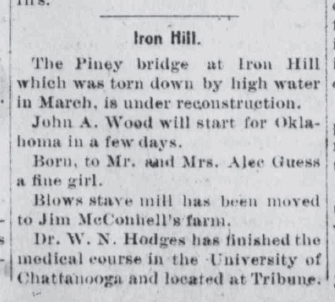 (Earlington, Ky.), January 2, 1902, page 3. Source: The Bee. (Earlington, Ky.), February 6, 1902, page 4. Source: The Bee. (Earlington, Ky.), February 20, 1902, page 4. Source: The Bee. (Earlington, Ky.), April 17, 1902, page 2. Source: The Bee. (Earlington, Ky.), May 1, 1902, page 5. Source: The Bee. (Earlington, Ky.), May 22, 1902, page 5. Source: The Bee. (Earlington, Ky.), June 5, 1902, page 3. Source: The Bee. (Earlington, Ky.), July 3, 1902, page 3.